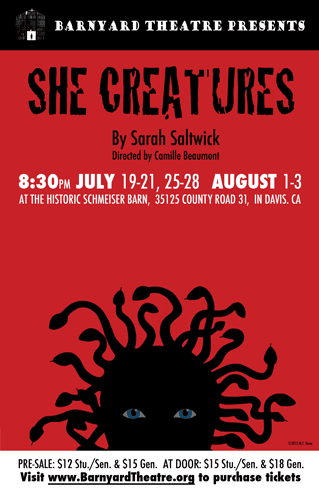 She Creatures poster, design by Maddie Stone. All performances begin at 8:30 p.m. at the Schmeiser Barn. The first woman, Pandora, awakens to life and opens her mysterious box. Mythical creatures emerge from its depths in this imaginative new play about the life experiences that shape the people we become. Unicorns come of age, shapeshifters prepare to raise children, and phoenixes and dragons fall in and out of love. Through their humorous and heartfelt stories, Pandora comes to learn what it is to be a human woman. Join us at the barn for a magical evening of original theatre! Kane Chai, Allie Polubiec, and Tim Smith as puppeteers.